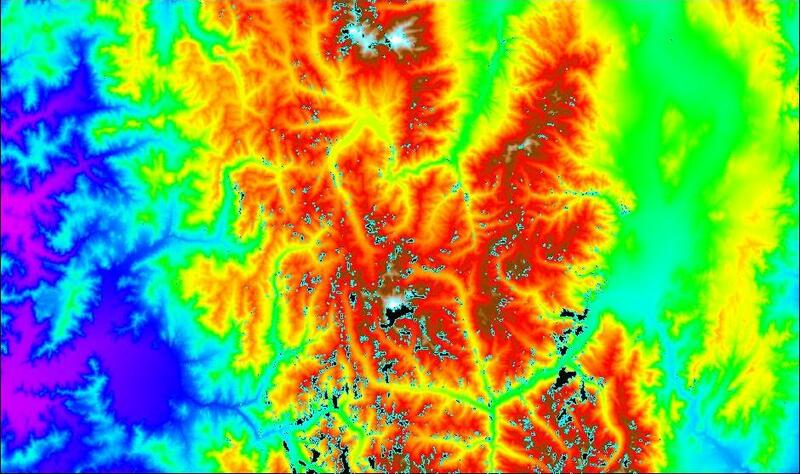 At this scale the entire 1 x 2 square degree splice of SRTM-based data is presented. The boundaries are 32° to 33° south and 69° to 71° west - approximately 69 x 117 statute miles (111 x 188 kilometers). Aconcagua is visible as a small white region just below the map center. The larger white region near the top is the Cerro de La Ramada group (20,945 feet = 6,384 meters). and funding by NASA - the National Aeronautics and Space Administration. A color gradient is used for representing elevation, with values in feet for the key immediately below. has a color corresponding to the next higher square of the key.